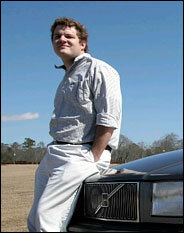 80'S VOLVOS REBORN Kenny Howard with his souped-up 1987 740 GLE in Auburn, Ala.
What does "over the top" feel like in NYC? ENNY HOWARD was cruising in his hand-me-down Volvo 740 when a shiny new Audi pulled up beside him. Engines revved, nods were exchanged, and Mr. Howard, a 24-year-old computer science major at Auburn University, cockily accepted the challenge. The V-8-powered Audi didn't stand a chance. "I beat him by two or three car lengths," said Mr. Howard, who spends his weekends drag racing his Volvo sedan along the industrial stretches of Montgomery, Ala. "That happens all the time. They look at you like you're crazy." Who can blame them? His Volvo, which came off the assembly line in 1987 and which he inherited from his grandfather, looks more suited for grocery shopping than back-street rallying. The lines are boxy, the proportions bulky and the color duller than pigeon gray. It was once sold under the family-friendly tagline, "We have children too." But the children are now in their 20's and early 30's. And instead of tossing their old Volvos into the junkyard, second-generation owners like Mr. Howard are grafting on turbochargers, computer chips and other doodads, transforming the faded yuppie icons into nonconforming speed demons. Once consigned to shopping malls and other suburban backdrops, the Volvos are showing up at racetracks and drag strips. "A Volvo makes a statement by not making a statement," said John Lomax, the editor of dialD Magazine, a monthly glossy about car customization published in Shreveport, La. "They are supposed to be the ultimate family car - suburban and clean-cut. This flies in the face of the Volvo mentality." "If you're tuning a classic muscle car or Honda," Mr. Lomax added, "there's not much differentiating you. Volvos are a mark of individuality." They are also a mark of trendiness, judging by the growing number of clubs, shows and self-published manuals devoted to turning vintage Volvos into Swedish muscle cars. "It's not about being flashy," said Jonathan Thompson, 25, an engineer from Brooklyn, who recently bought his fifth used Volvo. "The new ones just don't have any character." Enthusiasts are finding each other through Web sites and chat forums with names like Turbobricks.com, Swedishbricks.net, and Brickboard.com. (Turbobricks says it gets about 300,000 unique visits a month.) For the uninitiated, "brick" is a term of endearment for the classic, block-shaped Volvo - a design era that began roughly with the 140 models in 1968 and ended in the early 1990's when the 200 and 700 series cars were discontinued. Dana Howe, the 25-year-old Web master of Turbobricks, calls this period Volvo's golden age. "They are a great starting point to build a high-performance vehicle," said Mr. Howe, a telecommunications technician from Herndon, Va. The same features that appealed to safety-minded parents, like a rigid chassis and stiffened roof pillars, now appeal to hot rodders and drag racers, albeit for different reasons. "There's almost a roll cage built into the car," Mr. Howe said. His 1983 242 Turbo has $20,000 worth of engine tweaks, a stick-shift conversion, electronic valves, catalytic converters, shiny disc brakes, more efficient camshafts and Nascar-ready bucket seats, with four-point harnesses. The only thing that hasn't changed, he said, is the black carpeting. But except for a carbon-fiber tail wing, his car looks as clunky as the day he bought it in 1998 for $3,000. But having a roomy interior and reasonably long wheelbase has its advantages. "If one should hit a tree, there's plenty of car to deform before you encounter the tree," said John Lane, 37, a rally racer who has hit his share of obstacles. His 1987 Volvo 262 is retrofitted with a 500-horsepower engine and a fuel-injection system programmable from a laptop. "The worst of my injuries has been a scratch on the hand." Old Volvos are also prized for their rugged cast-iron engines and early use of turbochargers, which can easily be tuned for better performance. "I've seen many Volvo engines with 200,000 miles with absolutely no wear on the engines," said Peter Linssen, who owns a car repair shop in Portland, Ore., that specializes in Volvos. Such durability also means there is a glut of old Volvos on the market. And they are dirt cheap. A 1976 Volvo 240 with 130,000 miles, for example, has a Kelley Blue Book value of $995. A similar model sold on eBay Motors last month for $1,450. But for Doug Kauer, 21, a carpenter from Elk Grove, Calif., the major appeal is the wow factor. "People look at you weird," said Mr. Kauer, who has owned a squad of Volvos, including a cherry-red 242 Turbo that has undergone so many modifications it is barely street legal. "But as soon as you pop the hood, they swarm around your car. I go out and bust egos with it." That element of surprise may explain why old Volvos seem to be showing up at more rallies, speedways and autocross competitions. "I had a baby seat in the back, and I still beat all these guys with Mustangs and Corvettes," said Mr. Linssen, who drag races a 1985 740 Turbo. In fact, he nearly bested a Dodge Viper and Porsche 911 at a Sports Car Club of America contest last August. "They couldn't believe they were racing against a four-door family sedan," he said. For Volvo, which spent decades cultivating its safety record, the tuning trend fits a new, racier image. "We can't endorse what they're doing, but we encourage them," said Dan Johnston, a spokesman for Volvo Cars of North America, a Ford subsidiary. "We want people to think about us differently. We're not your mother's car. You can have fun with the car." IBM TotalStorage® Access, process, and protect your data in a more streamlined, more effective way.